... is now available on Google Maps Street View! It's the switchback down the plateau on the way from Flagstaff to Sedona, AZ on 89-A. At the top, it's pines, cedars and scrub brush. At the bottom, it's cottonwoods, ferns and water . 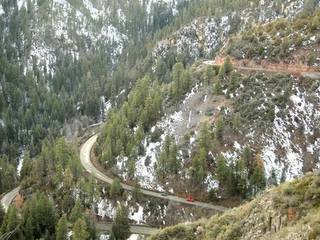 It's a drop of about 1,100 feet in less than 8 minutes of driving from 6,500 ft to 5,400 ft into Sterling Canyon alongside Oak Creek. By the time you hit Sedona, you've gone down to 4,200 feet, so there's a marked difference in temperature and weather (like from snow to balmy sunshine in the winter) - all in 45 minutes travel time. It's one of my yet-to-be realized goals to ride a motorcycle down(& up) that particular stretch of 89a. It's especially spectacular at night during a full moon!